With rising stress on water resources and the competing needs of businesses and communities, effective water resource management is crucial to a business’s ability and licence to operate, and the hotel sector is no exception. Yet, despite all we hear on water crises, how many businesses are factoring this information into their forward planning? How many have taken the time to learn about water issues in the areas they operate, in order to take appropriate actions? Are hotels using more than their fare share? Whilst perhaps not on the same scale as industry, it takes a lot of water to provide the standard which customers have come to expect in servicing guest rooms, use of laundries, landscaping gardens and through food and beverage operations. According to a forthcoming report from EC3 Global and Griffith University, the average Hong Kong hotel uses 389 litres of water per guest night. If a hotel has a pool or spa, this increases on average by 33%1. “The average Hong Kong hotel uses 389 litres of water per guest night. If a hotel has a pool or spa, this increases on average by 33%…. Given the average Hong Kong citizen’s consumption of 131 litres of water per day a figure already considered high by many international standards), the hotel sector is vulnerable to criticism, being perceived as taking more than its fair share. Hotels risk being increasingly exposed to reputational and potential operational risks in future years as resources become more constrained. The problem is that for many there appears to be no urgency to act at the moment. Similar to climate change, the risks seem to be just too far in the future. Unlike climate change though, where the business case for action can be built with even the most hardened climate sceptic due to the rapid cost savings that can be achieved, the same does not ring true for water. In many parts of the world, water is just too cheap to worry about. It almost always comes out of the tap. Water scarcity – present and future – is not on the radar for many people. That is not to say that the industry is inactive or in denial over the issue. Many hotels and hotel companies have adopted wide-ranging water saving initiatives and technologies across their properties. Increased monitoring and initiatives such as grey water reuse and diversion of water from tank cleaning exercises to irrigation meant that the Hong Kong and Shanghai Hotels for example used 6.1% less water in 2012 than the baseline of 2006-2008, in spite of business growth. Others support innovative water projects in key destinations, such as Marriott’s Nobility of Nature project which invests in innovative, large-scale conservation projects aimed at preserving the water resources for 2 billion people in Sichuan Province. One difficult question for hotels is where does the responsibility fall for dealing with water issues? The increasing trend to leased, managed and franchised models means that in many cases a hotel is built by one company, owned by another and operated by a third company. “The increasing trend to leased, managed and franchised models means that in many cases a hotel is built by one company, owned by another and operated by a third company. Each stakeholder will have different business objectives with a different business case for investment in sustainable water technology and management. Whilst the operating brands will seek to maximise operational savings, these may be limited by the infrastructure of the building which was built for low cost for quick sale. Real estate moves quickly in the hotel sector, with investment trusts looking to recoup their investments and turn a profit within a relatively short period – maybe just 5 to 10 years, meaning that projects with long payback periods do not get the go ahead. It is understandable that the hotel industry’s efforts on water resource management can appear fragmented at times. Though ownership may change, once a hotel is built it is likely to be in operation for a number of decades. The challenge going forward is to bring all the stakeholders together and start meaningful dialogue on how sustainable water management can deliver value to all sides in the short and long term. To make an effective contribution to a water management strategy, projects need to be backed up with solid facts on water risk in the areas a company or hotel operates, in order to provide a clear business case to act and a clear steer on what activities will be most effective. This is why the International Tourism Partnership (ITP) and its water working group commissioned the Stockholm International Water Institute (SIWI) to research water risk issues in key development areas for the hotel industry – Rio de Janeiro, Beijing and Shanghai, India’s Golden Triangle and Dubai. The study – the first of its kind – provides an overview of how freshwater may become a constraint to the hotel industry in the specified regions in terms of maintaining current operations, as well as future growth. It highlights a range of potential impacts the industry could suffer due to shifts in the availability and quality of water resources and points out potential areas where additional costs can be expected. The assessment also suggests possible mitigation measures that can be taken to reduce negative impacts. Headline findings cite China as likely to experience water shortages, increasing flood risk and pollution, as well as possible price hikes due to increased costs of water treatment in the coming years. This is of particular concern to the industry as Asia Pacific continues to be the world’s fastest tourism growth region, with a total of 216 million international tourist arrivals in 2011, according to the United Nations World Tourism Organization (UNWTO) (2012). These are compelling calls to action and having hard facts on which to base long-term business decisions is infinitely preferable to simply sticking on low-flow showerheads and hoping for the best. We hope the findings of this report will help hoteliers understand the local context where they operate and develop appropriate water management strategies. 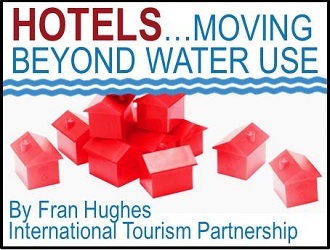 In it’s next phase of work ITP’s water working group is collaborating to create a body of resources and reference materials to build a strong business case and support hoteliers, owners and developers to implement future-proofed water strategies. This will move the industry from a position of simple water efficiency to true water stewardship. Water Sense – Water Saving Technologies for Buildings: Property managers focus on saving energy over saving water. GreenLink Global’s Mona Ip explains why saving water in buildings will not only save costs but protect asset values. The Rise of Protests & Reputational Risk: With a recent survey indicating over 500 protests daily, Lisa Genasci examines the reasons for the rise and the role and impact of environmental protests in China today. Fran Hughes is Director of the International Tourism Partnership (ITP). ITP is a global industry organisation, bringing together the most powerful hotel companies in an alliance focused on a single ambition: to lead the industry through example with clear and quantifiable commitments to improved sustainability. ITP believes that the hotel industry can be a force for good and make a positive contribution to the United Nations Sustainable Development Goals and to the COP21 climate agreements and that bigger impacts can be achieved faster through the industry working together at scale. ITP’s collaborative work focuses around four critical goals on carbon, water, youth employment and human rights. ITP works with its members to drive continual improvement through promoting and sharing best practice through its online magazine www.greenhotelier.org, offering a range of practical products and programmes, such as the Hotel Carbon Measurement Initiative (HCMI) - developed in partnership with the World Travel & Tourism Council; and setting the agenda on sustainability through collaborative working groups and issues management. Fran has over 25 years’ experience in the tourism industry and holds a Master’s in Environmental Strategy.